Global Travel Media » Blog Archive » Park Trek’s New Bay of Fires Walk Sale Now On! Park Trek’s New Bay of Fires Walk Sale Now On! Explore the Bay of Fires, over four fantastic days of walking and sightseeing. Enjoy spectacular beaches, marvel at amazing rock and swim in crystal-clear waters of the Tasmanian east coast. Book with Park Trek before July 31, 2016 to receive 20% off this amazing four-day walking tour departing and returning to Launceston. This special deal offers great savings for guests to experience the wonder of walking in this stunning part of Tasmania. Tour cost is usually $1,850 per person twin share, this 20% off special offer provides a saving of $370 per person with the trip costing $1,480 per person twin share. Single supplement available upon request (additional cost applies). Simply add ‘Bayoffires’ to the promo code when booking online. The Bay of Fires walk contains rocky gullies, with many small secluded beaches and inlets to explore, and beautiful coastal landscapes. There is a wealth of local wildlife, including birds, eastern grey kangaroo, wombats, Bennetts wallabies and Tasmanian pademelons. This 4-day fully accommodated trip includes all transport, delicious meals and fantastic guides. 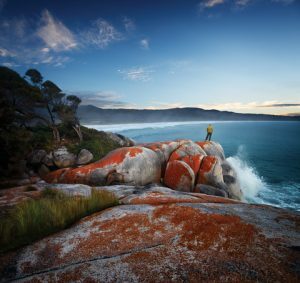 Stay in the unique Icena Farm House, explore Mount William National park, visit the impressive pink granite lighthouse at Eddystone Point and walk through some of the most beautiful and unaffected parts of the Bay of Fires Conservation Area.